Made easy to take soft gel capsule. Hemp Seed Oil: Nutrient packed Omega 3, 6 & 9 from plant based hemp seeds. Produced in a GMP production facility in Australia. With Omega 3, 6 & 9. Taken regularly, hemp seed oil is a natural source of Vitamin E, potassium, magnesium, iron, zinc, calcium & phosphorus. 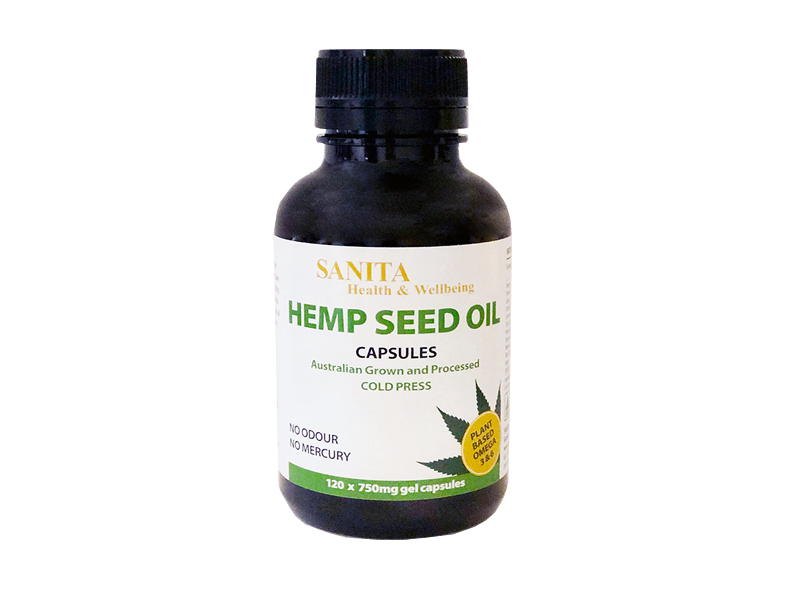 SANITA Health Hemp Seed Oil with Omega 3,6 & 9 is a true Australian Grown cold-pressed oil, extracted (expelling of the raw seed) and made in an easy to take soft gel capsule. Produced in a GMP production facility. 100% PURE AND COLD PRESS. Made easy to take soft gel capsule. One of nature’s richest sources of Essential Fatty Acids (EFAs) and Gamma Linolenic Acid (GLA). Hemp seed oil includes the EFAs Omega 6 & Omega 3 in a naturally occurring 3:1 ratio, considered an essential part of a balanced diet. A great plant-based alternative to conventional fish oil. Considered as nature’s “THE MOST BALANCED OIL”. This is because it provides the right balance of Omega 6 to Omega 3 in a 3:1 ration, which is considered an essential part of a balanced diet. As a matter of fact, it is often said that the balance of EFAs in hemp oil is so perfect that you do not need to supplement hemp oil with any other oil because the EFAs in hemp oil are perfectly balanced for proper absorption by the human body. They are “essential” as our body cannot make them, so we need to have them in our diet. They’re necessary for cell and body growth, maintenance of cell membranes and keeping our hearts healthy. A diet lacking in EFAs can contribute to simple items like dry skin but can also become more severe like allergic reactions and compromised immune response. In addition to hemp oil having this perfect balance, it is one of nature’s richest sources of EFAs (essential fatty acids) the only oils that has sufficient levels of the elusive gamma linloenic acid (GLA or Omega 9) and the only source of this EFA that actually tastes GREAT!!. For nutrition, it is unparalleled as it provides a range of necessary nutrients and helps prevent a variety of common diseases. Children: 1-2 capsules per day. Not recommended if under 5 years old. Storage: Cool and dry environment. After opening, please refrigerate. CAUTION: If you are pregnant or nursing, consult your doctor before use. Suitable for vegetarians & vegans. Consume in conjunction with a nutritious diet. Young children can choke on capsules. If you are taking prescription medication, please consult your healthcare practitioner before you use this product. Hemp Seed Oil: great source of high-quality nutrients. The only plant that contains all of the essential fatty acids, amino acids and minerals required by the human body. These essential nutrients affect a variety of body functions, including metabolism, skin, mood, behaviour, brain, and heart.